There are a number of great benefits from choosing a tungsten ring. While people commonly discuss the strength and permanent shine of tungsten rings, other qualities, like the potential for slick, professional engravings can fall by the wayside somewhat. That said engraving is one of the best ways to add an extra personal touch to a tungsten ring, whatever the occasion. However, if you find yourself with a mind blank for what to have engraved after putting all of your efforts into finding the perfect ring, you are not alone. 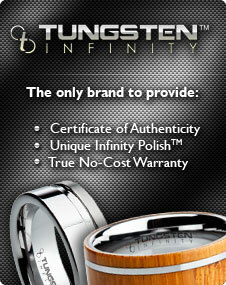 The great thing with tungsten rings is that you can engrave both the inner and the outer ring. As an added buying guide, you should know black tungsten rings look amazing engraved as you get the contrast between the black and the tungsten shining through. But what are the things you might engrave your tungsten ring with? Most common when given on wedding day or for an anniversary, you could also go for a birthday, the day your children were born, or any other date that means something to you. Another wedding staple, and one that you might even have engraved alongside the date of the big day. Whether you just go for plain names or a message along the lines of, “I belong to X,” is up to you, but it can be an excellent way to give your rings the added personal touch. Again, your options open up depending on who the ring is for, although putting your own name on it if you’re buying it for yourself is perhaps taking things a little too far. These could range from cultural patterns and symbols, such as Celtic ones, to something that you stumbled across in a shop and just happened to like. While many tungsten rings will be ready produced with symbols, images, or patterns, you will often be able to customize your ring how you want it. What song lyric always makes you think of your loved one? Is there a line from a book or a poem, or a joke that you share together, which always brings them to the forefront of your mind. This is probably the best way to give a tungsten ring the truly personal touch, although if you go for a message on the outside you may need to consider that you could be explaining it to someone later, particularly if it has ‘rude’ connotations. This is an extension of private messages, really, but if there is a saying from a TV show or another pop culture reference that a person loves, it is definitely an idea worth exploring. Even if something is well-known and even achieved cliché status, all that matters is what it means to you.